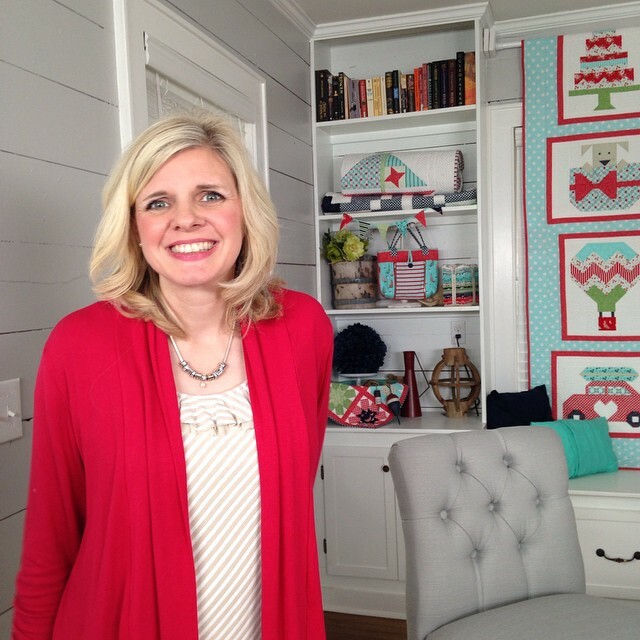 This is Kimberly over at Fat Quarter Shop. Pardon my quick interruption, Moda has graciously allowed me a little post to talk about the new Snapshots Quilt-Along starting right now over at our blog, the Jolly Jabber. I could go on and on about this quilt-along, but I’ll try to keep it short! 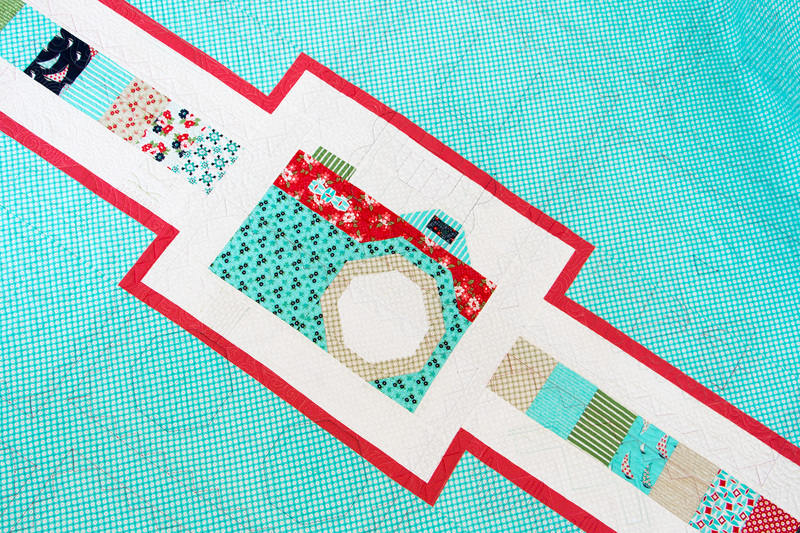 The Snapshots quilt features twelve knock-your-socks off novelty blocks that celebrate moments of happiness in our lives, complete with an extra special pieced backing with a camera block. I think the photos speak for themselves! Most importantly, this quilt-along will support a great foundation doing really important work, the St. Jude Children’s Research Hospital. If you don’t know about them yet, I encourage you to find out more. In a nutshell, they treat children with cancer, research for cures, and never send families a single hospital bill. How amazing is that. But they’re able to do it through charitable contributions, which is why we’re pitching in with Snapshots. 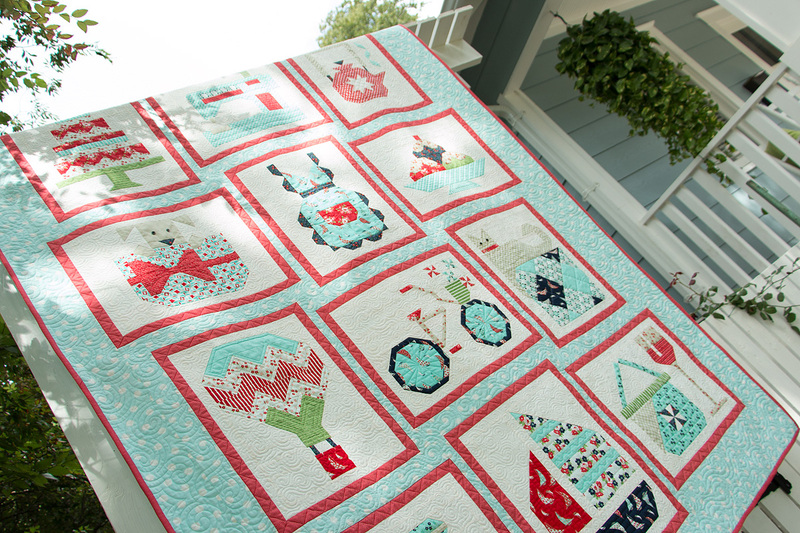 Every single pattern to make this quilt — the blocks, the finishing, and even the specially-pieced backing — will be available for free on our Snapshots blog page. We’ll post a new pattern and tutorial video on the 15th of each month throughout 2015, and the finishing and backing patterns will be released in the summer. We would love for you to donate to our St. Jude Fundraising page for the use of each pattern, even just $5 per pattern, to reach our goal of $10,000 by the end of the year. Moda Fabrics is awesomely partnering with us to match your donations dollar for dollar, up to $10,000. So really, our ultimate goal is at least $20,000 raised for St. Jude! In our quilt, we used Daysail, the upcoming fabric by Bonnie & Camille, and we have Daysail quilt kits if you’d like to make a quilt identical to ours. But if you want to use another fabric collection or your stash, we have fabric requirements posted on our Snapshots page so you can gather together what you’ll need. 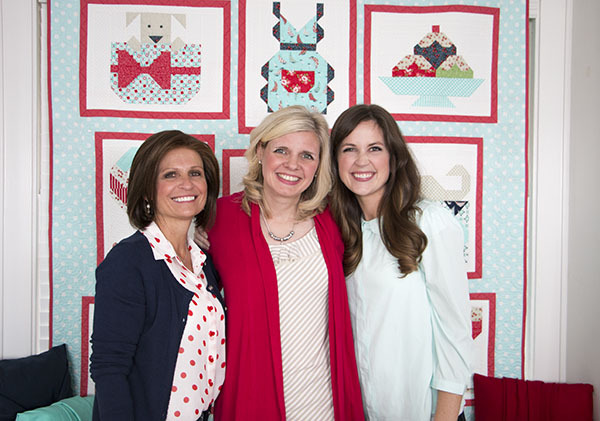 Speaking of Bonnie & Camille, we are so grateful to these ladies for helping us film all of our Snapshots video tutorials. They went above and beyond to be with us, and guess what? They’re sewing along too! You can watch our intro video here, and in each video you’ll get to see us presenting the blocks with some sweet memories of our own, all year long. Bonnie & Camille snuggling up, aren’t they adorable? So, are you hooked yet? Will you sew along with us? Please, please do! I’m so excited to see the quilts everyone is going to make. On our Snapshots page, you can also find other bloggers who’ll be sewing and posting their blocks with us, and on Instagram we’ll be posting our progress with #fqssnapshots. Don’t forget to tag your Snapshots photos so we can keep up with you too! If you’re wanting to do this quilt-along in your local store, go for it. We just ask that you please donate to our fundraiser and not charge for the free patterns, because, well, they’re free! Thanks for reading, and thanks to Moda for letting us post our little Snapshots PSA. I have made Quilts for St. Jude when Hancock Fabrics used to sponsor this great cause. If I make this quilt using my own fabrics, where would I send it? And, would I have to pay the $5.00 per block download if I use my own fabrics? **Please note handmade gifts must be crafted with brand new materials, made in a pet and smoke free environment, and packed individually in Ziploc bags without personal information attached.